As I stated last week this week is a freezer week for my family. By eating leftovers out of the fridge once a month I am able to save money and not waste food. I tried doing it once a week with the leftovers from that weeks meals, but my two sons complained about eating the same meals twice. With a few weeks in between they forget the first time they ate the meal and happily eat the freezer leftovers. Even though most of the meals have been leftovers I have baked and cooked sides. I had a number of pounds of hamburger meat that I had ground so I made burgers with it this week. To save money I always make my own hamburger buns. 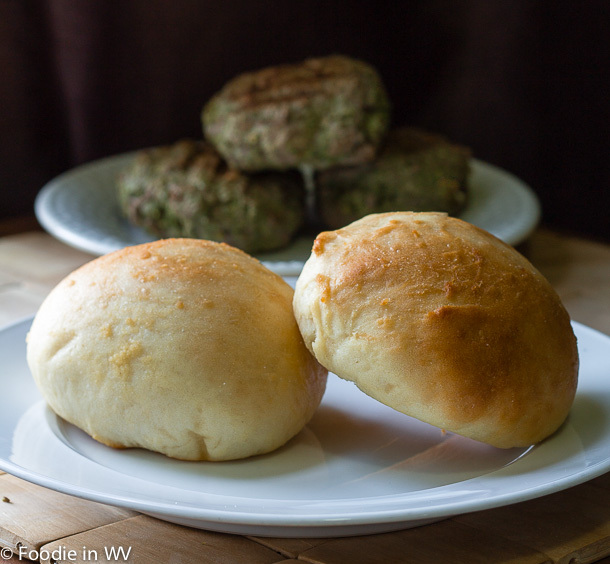 I have a favorite recipe that I have used for years, but this week I ran out of town so I tried a new recipe for 40 minute hamburger buns from Taste of Home. This recipe has 7 ingredients. It takes 40 minutes of total time, 20 minutes of which is active and makes 12 servings. I eat gluten free, but the rest of my family has no problems with gluten. Luckily I have never had a reaction cooking meals for them making wheat flour, I just make sure to keep my cutting boards etc. separate. For bread I always using King Arthur Bread Flour. I really find that it makes a superior product and the texture is great. I actually ran out of bread flour at 2 cups, so for the other 1 1/2 cups I used brown rice flour. This recipe is pretty straight forward and the only major changes I made were to make 7 buns instead of 12 and increase my baking time by 5 minutes since my buns were larger. While my family still prefers my normal recipe for buns (which takes 6 hours with rises) this recipe was well received and I really like that it only takes 40 minutes start to finish. Making homemade buns and breads can be time consuming and this recipe is a nice way to get homemade bread on the table quickly. For the recipe go to 40 Minute Hamburger Buns. They really are easy and my kids love them! I may just try these. I've made homemade bread before, but never hamburger buns. I bet they are awesome! They really are great and so much cheaper than store bought. Such a great recipe... thanks for sharing..
Great recipe. I only have had store bought. I'd actually like to try bread making too. This would be a great place to start since the recipe is very simple! Oooh, these look good! I've tried making homemade hamburger buns a couple times because everything in the store has like a million ingredients. I don't like eating processed bread! I agree with you on the processed bread, there are 30 ingredients it seems in most brands which is way too many! Hamburger buns in 40 minutes? Perfect! For whatever reason, I never seem to have bread around, so these would be nice for when I need to make some quickly. I don't keep a lot of bread around either :) Mostly because my kids eat whole loaves of bread in one sitting! I want to make these but eat them without the meat! What a great recipe for summer cookouts..Thank you for sharing with the Clever Chicks Blog Hop this week; I hope you’ll join us again!